Zombie Tsunami is the adaptation of the mobile game of the same name with more than 200 million downloads and 3 million daily players! 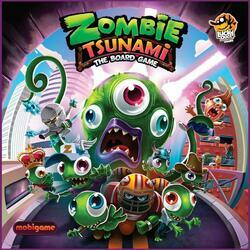 Zombie Tsunami is an atmospheric game played by 3 to 6 players in less than 30 minutes. Each player takes the place of a leader of a horde of Zombies. They will have to collaborate but also betray each other in order to be the first to win! Zombie Tsunami was funded on the Crowdfunding Kickstarter (See the campaign) platform on the 01 June 2017, the campaign lasted 23 days. 1,663 people helped funded the game, whose the amount requested was $10,000.00. Thanks to these 1,663 people the game could be funded up to $78,718.00, ~787.18%.